Transitional CGT relief is temporary relief available to all complying super funds, not just SMSFs, for certain Capital Gains Tax assets that would otherwise give rise to a taxable capital gain through the necessary efforts to comply with the new transfer balance cap and new conditions to be applied to transition to retirement income streams (TRIS). Upon the introduction of the transfer balance cap, effective July 1, 2017, some SMSF trustees will need to scale back existing pensions so that members do not exceed their transfer balance cap, which is $1.6 million for the 2017-18 financial year. If CGT assets are sold to enable the commutation and withdrawal from existing pensions, then the current law will apply to these disposals and the transitional CGT relief will not apply. 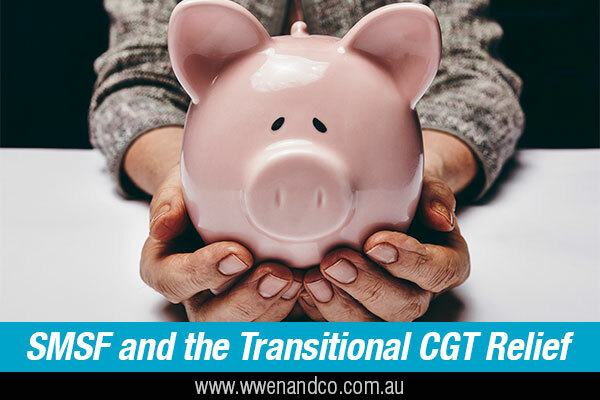 Conversely, if a fund member decides to commute a portion of their superannuation interest that currently is in the pension phase, back into the accumulation phase, then the transitional CGT relief will be relevant. This is because investment earnings, including capital gains, are taxable in the accumulation phase. Additionally, from July 1, income from assets supporting a TRIS will not be eligible for an exemption from income tax on earnings, so the CGT relief provisions will be relevant for superannuation members receiving a TRIS. Trustees can choose to apply temporary CGT relief if they hold the asset throughout the period November 9, 2016 to June 30, 2017 (the “pre-commencement period”), and will need to do so before they are required to lodge the fund’s 2016-17 tax return. Assets purchased or sold during the pre-commencement period are not eligible for relief. Reset the cost base of an asset to its market value (this is where trustees reallocate or re-proportion assets from retirement phase to accumulation phase). The market value would be determined under the ATO’s valuation guidelines for SMSFs on the date of the asset transfer, or June 30, 2017 where assets are re-apportioned. Defer a capital gain that arises when resetting the cost base for re-proportioning assets where you use the proportionate method. If a trustee has been using the segregated method, and either continues to use it or switches to the proportionate method, an asset must cease being a segregated current pension asset at a time during the “pre-commencement period” to be eligible for relief. The capital gain or loss for that asset will then be entirely disregarded. the trustee makes and records an election to switch to the proportionate method. The ATO has published a Law Companion Guideline on the relief measures, and we are happy to provide you with a link to this and discuss your options if you think it could be helpful.